Princess Madeleine of Sweden and Chris O'Neill were seen in St Tropez in which they are having a holiday last week. 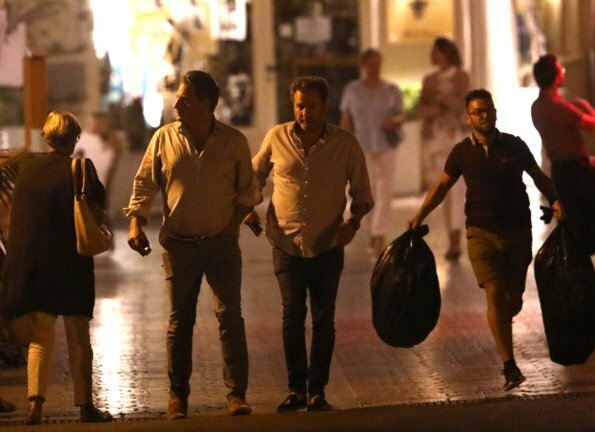 Princess Madeleine, her husband Chris O'Neill and their friends Natalie Rosta Werner and Dag Werner got together for a evenings dinner at L’Opera and Brasserie des Arts Restaurant in St. Tropez. The Princess wore a floral-print cotton top by Zimmermann and a white Zara jean. These photos are from a few months ago. Chris is such a slob.. I agree. Even the guy running with the rubbish bags looks better. The one with Madeleine in the photo is not Chris; he is in the photo of just the two guys walking. So unkempt. Reflects poorly on Madeleine in my opinion. Considering all these people do is go on vacations you would think they ( Chris) would take better care of themselves. C'est dur, la vie de conjoint de princesse, et d'etre en vacances a St. Trop. Madeleine is a very beautiful woman and looks healthy, hot figure!! Madeleine should ditch the white Zara jeans and switch to the trousers of her friend Natalie. Her friend Natalie is the only one who looks stylish here and is dressed in a flattering way. Vanessa, that's what I meant, ha ha. I know. I wrote my comment in agreement with yours. Have a nice week-end, where-ever you are :)! I don't think Chris is in any of those pictures. You can clearly see him in picture number 3, he looks more flabby then ever! Elin, Germans say: "Die Liebe der Frau erkennt man am Anzug des Mannes." (which means, you'll see the love of a wife when you look to the outfit of the husband...) Wow! !